Ananka's Diary: The Georgia Gorilla: Has the Body of a Bigfoot Finally Been Discovered? Hey btw the second link doesn't work for me...? 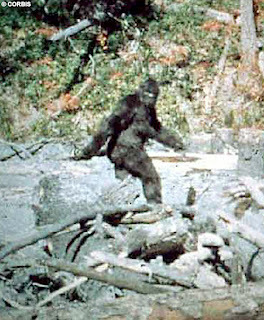 Wow.. My computer froze on the picture of the Bigfoot... Then it wouldn't load... But that's really interesting! I wonder if they'll dissect it! I wanna see rest [you can see it's stomach!] of the Bigfoot's inwards! Yes, this is exciting, but I'm a bit sceptical... wouldn't this be on the news? cool! awesome! hope it's really bigfoot! I'm skeptical... I think it's a hoax. These guys have had previous hoaxes. OFF TOPIC: you need to write something abot julia child(cook on PBS lol)!!!!! i saw on the news that she was a spy!!! Xena Twerp: Good idea! Julia is one of my all-time heroes! i agree with lookbooks. My Dad said Bigfoot os supposed to be in the Cascade Mountains in Washington, so what is he doing in georgia. I've been following this on other sites-- looks like a bunch of skeptics have found a costume that looks an AWFUL lot like that body. Also there's a report that "the body has been moved." which could very easily lead to the body vanishing and no tests ever being performed. *cries* pleeeeeeease don't be a hoax it'd be so massively cool if it were real! I sincerely hope this is real!!!! I was reading a novel about transgenics yesterday... maybe some mad scientist has finally found away to make animal-human hybrids. Okay, would someone mind telling me what on Earth cryptozoology is? Phoenix: Cryptozoology is the study of mysterious animals that might or might not exist: bigfoot, nessie, chupacabras, stuff like that. o gross! that pic is pretty nasty, but i've read much worse stuff (ugh, i just got a little gag-ish). too bad it's not real though. or maybe its a good thing. LONG LIVE BIGFOOT! ok, sorry, i got a little worked up just then. ok, i guess i'll stop rambling to you innocent commenters.